What on Earth is this? - Have I found a Stone Age tool? Q. I found this object in my garden/while walking the dog/on the beach/in my grandad’s shed. It looks just like an arrowhead/spearpoint/hand axe/ pointy Stone Age thingy – is it a human artefact? A. Maybe - and maybe not. It all depends on several important features, listed below. The first thing to test is how hard the rock is. Flint is very hard – almost as hard as diamond. Can you scratch it with a metal point like a door key? If you can’t, it’s probably flint. If you can, it’s a relatively softer rock such as Sandstone or Limestone - rarely used for tools because they are just not hard enough to retain an edge. Flint is also too hard for humans to cut anything fancy like lines, patterns, designs, or faces. 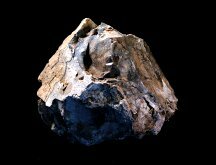 So if you find a piece of flint that resembles a face or a figure or an animal or any other complex shape, it is a geofact – a natural accident. This is especially true of beach pebbles. Does it have a striking platform? 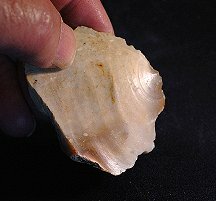 To strike a flake from a piece of flint, you must have a flat surface, that you strike near the edge to chip off a flake. Unless you have this ‘striking platform’, you will not get any usable flakes. So all the flakes struck from a flint core will retain, at one end, a small part of this platform. Often this remnant of the striking platform is lozenge-shaped or triangular in outline. Sometimes it is quite small and has to be searched for. 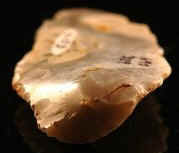 But it is always present in a humanly struck flint flake. If there is no platform, then it most likely isn’t an artefact. Does it have a striking point? Just below the remains of the platform there will in most cases will be a sharp little point at the precise spot where the flake was struck by the hammer stone. This striking point is usually very prominent and is another characteristic of humanly struck flakes. Flint shatters like glass and on the surface where it is struck there are often a series of ripples where the shockwave of the strike travelled through the flint. These are more visible on some flakes than on others. The ripples, where present, are useful because they indicate the direction from which the blow was struck and radiate away from the striking point. Does it have a positive bulb of percussion? In some cases, a series of ripples is not apparent, but even here, the first ripple in the series is usually very prominent. This is immediately below the striking point and is called the ‘positive bulb of percussion’. This bulb gives a very distinctive curvature to the flake. Does it have an erailleur scar? 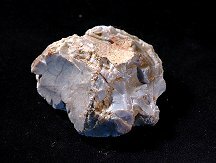 In a large number of cases, when a flint flake is struck, a secondary small flake ‘pops’ away from the striking point and lays along the positive bulb of percussion in the direction of strike. This can be a useful additional indication of human manufacture. Are there removal scars of previous flakes from the back? 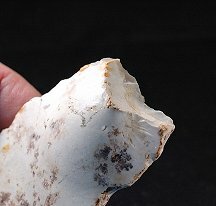 The flake you find may be the first that has been struck from a core – a so-called primary flake - in which case it will still have a considerable amount of rougher cortex adhering to it. But it may be the second or third flake to be removed from the core, in which case it will have evidence on the side opposite the striking point of the removal of previous flakes. This evidence take the form of flake removal scars separated by ridges called arrises. This is very strong evidence for human origin, but unfortunately is sometimes mimicked naturally in geofacts. By far the strongest evidence for human origin is the retouching of one or more edges, either to sharpen them or to dull them to make them easier to hold. Unfortunately again, this evidence is sometimes mimicked (or obscured) by natural damage. An edge that has been retouched to make it sharper usually show a series of small, overlapping scalloped depressions, rather like the edge of a bread knife. These can be very fine as they are made by the point of a bone or antler tool. Easier to spot is ‘invasive retouching’ – that is small flakes made at a very low angle to the edge of a large flake. This is rarely mimicked by nature and is an almost sure sign of an artefact. Is it uniformly coloured (patinated)? 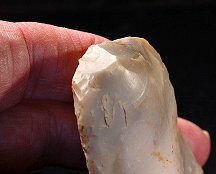 When a flint implement is freshly struck, it will usually be a dark grey or even black colour. Once it is buried, the skin starts to weather to a lighter colour. If every part of the flint you find is the same colour, then its facets could have been made all at the same time, by a stone age human (like those illustrated above). 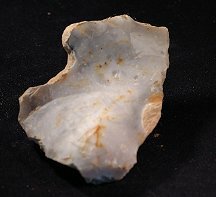 But if different parts of the flint are different colours, then they were made at different times and so are probably natural. Finally there are some sources you can consult to make comparisons. 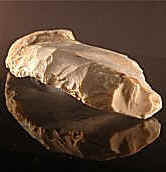 Is your find like any of the flints pictured here on The Stone Age Tools Museum website? Make a comparison with the photographs on this site to see how many points of similarity you can find. Be suspicious of anything that has a unique appearance. 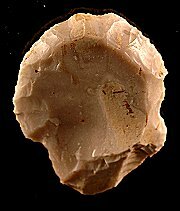 Many stone age campsites have been excavated, sometimes yielding thousands of tools, but archaeologists almost never find unique tools – the tools always conform to known types. 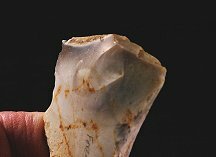 Stone Age men and women learned to make tools in a certain way and then stuck to that pattern just like, say, a carpenter or a glassblower today. They didn’t improvise – they learned their survival craft and used it well because it was tried and tested. Is it like any of the flints on the Portable Antiquities Scheme site? The Portable Antiquities Scheme was started so that members of the public can submit and publish details of their archaeological finds. Once you have signed up, you can browse the tens of thousands of photos of implements that people have found – including those found in your own geographical area. Seeing what others have found and identified is very helpful in getting to know the kind of things that are most commonly found. Through the scheme you can also get the contact details for the Finds Officer in your county and approach him or her with details of your finds. Is my find worth a lot of money? Can I sell it on eBay for a small fortune? 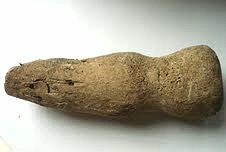 There is a trade in prehistoric artefacts on the internet, but it isn’t much of a one. 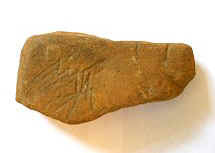 Even exceptional finds such as complete palaeolithic hand axes in fine condition fetch only around £100 or so. 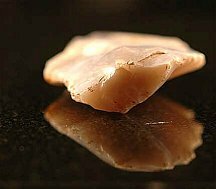 A run of the mill flint artefact is barely worth a few pounds or even pence. The best thing you can do is measure your find in terms of length, breadth, height and weight, and post these details on the Portable Antiquities Scheme site so that your find may be helpful to archaeologists studying the prehistory of your area and Britain in general. Then use your finds to start your own collection. The following are a few examples of the odd objects that you are likely to find while field walking. 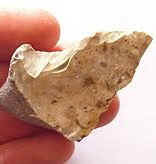 Stone age flint knappers produced a large quantity of flint waste and flakes that they did not use for tools. These waste flakes are known by the French term debitage. It is very common to find such waste flakes in almost any ploughed field in southern Hampshire and West Sussex and elsewhere in Britain. Some of them are attractive in the own right and worth collecting. 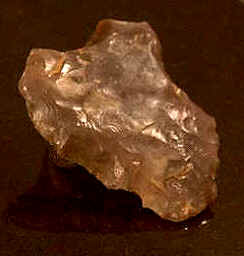 In the Mesolithic, people would commonly surround their fires with hearth stones, often flints. And early pottery was not fireproof. To heat water, people would place stones in the fire and then transfer them to the pot - hence the term pot boiler. Heating flints in the fire, as hearth stones or pot boilers, caused them to crack and craze and gave them a uniform grey appearance. The presence of many such heated flints on a site may be a good indication that it is a camp site. This hearth stone or pot boiler is a whole flint nodule, complete with exterior cortex, that was placed in the fire. As it was surounded by cortex, the flint did not crack and craze, but the outside became black and shiny. 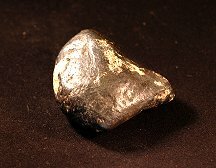 Such stones are sometimes mistaken for meteorites. 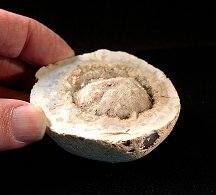 This is an ordinary flint nodule, but one that has formed in a near spherical shape, giving it the appearance of something artificial. 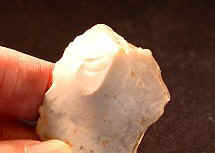 It's hollow interior contains tiny quartz crystals (flint is a form of quartz). 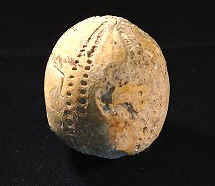 When flint formed on the beds of ancient seas, it evidently underwent a liquid or gel-like phase, because flint nodules are often found that have formed inside a fossil sea creature - in the cases above, sea urchin shells. 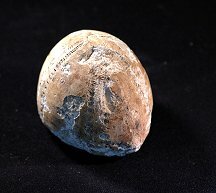 The shell has subsequently decayed away, leaving a flint cast. 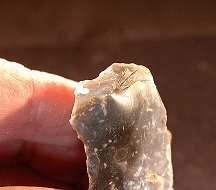 Contacting me: If you have been through the checklist on this page and you think you have found a stone age implement, then email me some photographs and details of where you found it to this email address. I'll do my best to identify it for you.